After 3 days of sunny, dry weather the rain has returned today. while Handel's Messiah played in the background. I made apple hand pies and strawberry-cream cheese hand pies for a baby shower that I went to this afternoon. I love to cook, so it was a pleasant task. It was also a pleasure to do it for the sweet, young mama-to-be who attends our church. I read this verse this morning and it stuck with me throughout the day. but the attitude I do it with can make all the difference in the world. but if I do it as if it's for the Lord, that too, makes a huge difference. on the days when the tasks aren't as enjoyable as baking pies. Such a great verse, and a reminder that no matter what we are doing, it is all for the Lord! Have a beautiful Sunday! Thanks for the reminder to keep our focus on the Lord, not on man! I have no idea what a hand pie looks like but it must be good if strawberry cream cheese and apple go into them! Your verse today is a timely reminder. Thank you for the wonderful reminder to be thankful for the tasks and job we have to do. The first task that came to my mind to be thankful for was cleaning toilets, I detest this job but am reminded to be thankful I have toilets to clean, some homes in Beijing China do not. Stopping by for a visit from Jumping Tandem! Happy Thanksgiving to you and yours! 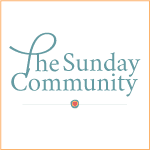 Please add the ladies from my chronic illness group in your prayers today. May they experience the Heavenly Father's love and comfort. In Jesus name. Amen! I pray it sticks with me to and thank you for always an encouraging word and thought! I bet the hand pies were super yummy! I think that picture is a wonderful illustration for that verse. It actually happens to be one of my very favorites. When I taught in a Christian school, I had it displayed in a huge banner that spanned the largest wall. I was delighted to be reading from my grandfather's old papers from seminary and discover that it was one of his favorites too. I never knew that. He died when I was a little girl. I just thought that was cool. 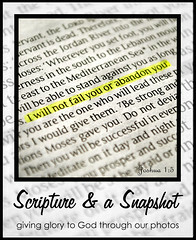 I love the simple beauty of your photo, and that scripture I try to keep tucked in my heart!! 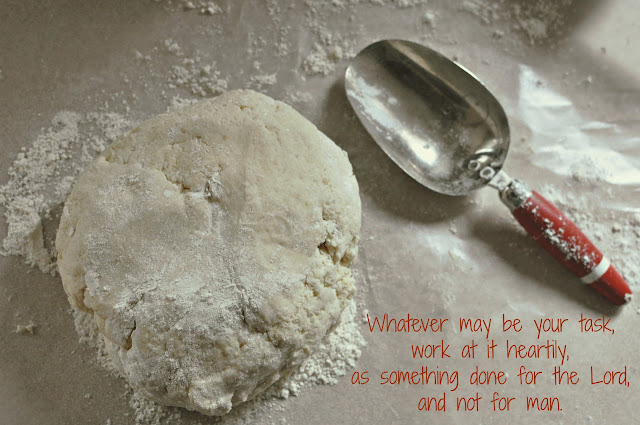 When I find myself grumbling about some task or having a bad day at work, I try to remind myself of this verse. Your desserts sound amazing :) Thanks for stopping by Chaos & Coffee! Have a blessed day! !